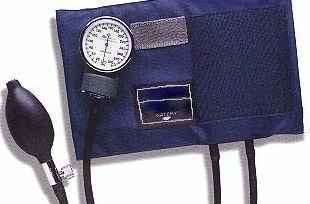 Lumiscope Professional Aneroid Sphygmomanometer: Limited Lifetime Calibration Warranty. Velcro Adult Cuff. 2 tube bladder, the gauge hooks onto the cuff. Sphygmomanometers include a standard air release valve and carrying case. No-pinstop professional gauge. Non-latex bladder is blue and matches the blue nylon cuff.